As I’m sure you all know by now, I love walking food tours. I try them in every city I can. 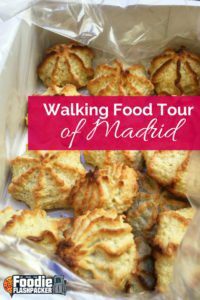 Spain is one of my favorite countries in the world, and a foodie heaven, so I knew I had to do a walking food tour of Madrid during my visit. I chose to walk with Devour Tours, and I couldn’t have been happier with my choice. 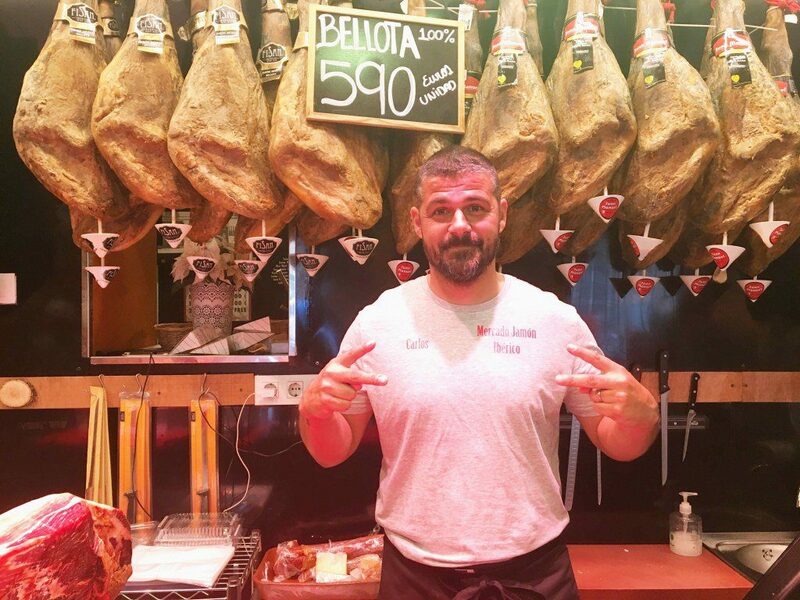 Devour Tours is known as the best food tour company in Spain. In fact, they are so popular that you can take tours with them not just in Madrid, but in many of the most popular cities throughout Spain. One thing I love about Devour is that they focus on partnerships with small or family businesses. They don’t lead you to tourist traps. I appreciate this because I enjoy discovering out-of-the-way places that have never been listed in guidebooks. It’s like having a local friend take you around to all their favorite spots. We started the day by meeting in Plaza Mayor, a central and easy to find spot. This is great, because even those unfamiliar with the city should be able to locate the large plaza. It’s also an appropriate place to start a food tour, as it used to be a food market. We quickly made introductions, and then we were off to our first stop- a pastry shop that has been in operation since 1855. The original owner was actually the queen’s personal baker. When he asked to go out on his own, she not only gave him permission, but actually set him up in business- that should tell you how good this place is! 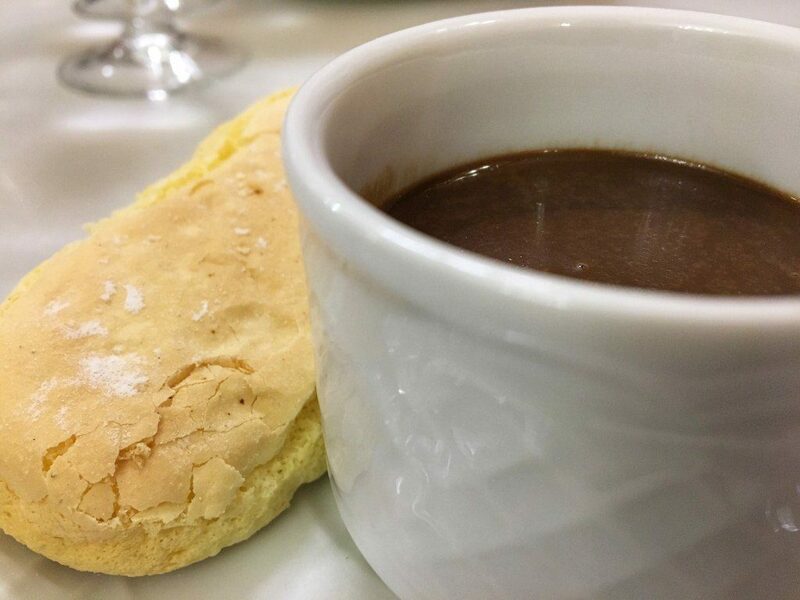 We started with a typical Spanish breakfast- coffee and something sweet- melted spiced chocolate with a light biscuit for dipping. As I always mention, I don’t have much of a sweet tooth, but those on the tour who did went for seconds on this one. Pure, melted chocolate with a flaky biscuit to scoop it up with- the kids on the tour couldn’t have been happier! During breakfast our guide Joy explained the Spanish eating schedule to us. In the morning, you have coffee for energy and something sweet to quickly get you out the door to work. Between 11 and 11:30, you enjoy a second breakfast, something a bit more substantial. Lunch, the largest meal of the day, is eaten at 2pm (at the earliest). 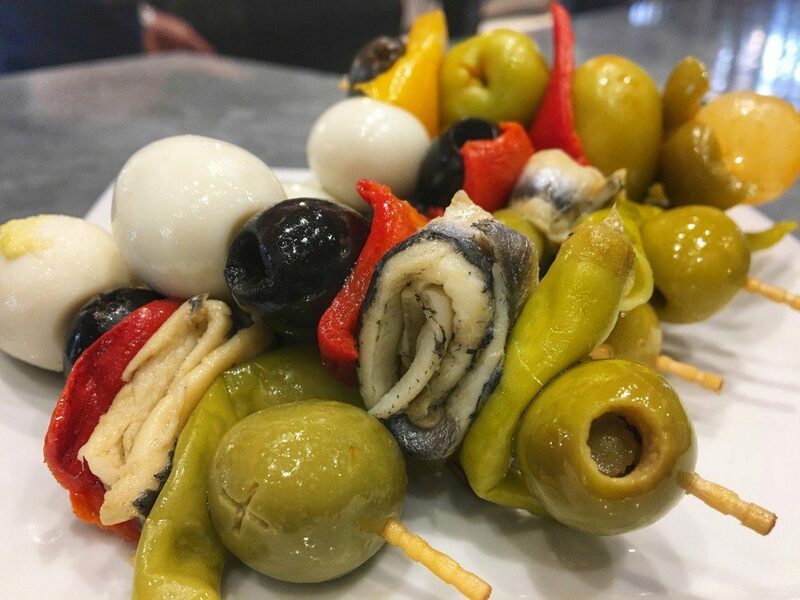 Around 7, you would have a snack known as an aperitivo (appetite opener). This usually consists of cocktails and small snacks. Finally, the Spanish indulge in a late dinner, usually between 9:30 and 10 pm, but never before 8. Because you’re eating so late, dinner is usually small and is often simply tapas. I’ve fallen in love with this way of constantly eating all day long! Something else that made this first restaurant unique is that instead of being passed down to family members, the place is passed down from the owner to their favorite employee. Talk about a great incentive for working hard- you could possibly inherit the entire restaurant. On a combination sugar and caffeine high, we set off for our next destination: a local market. This market is not only known as the most beautiful in Madrid, but is also famous for housing all of Spain’s cuisines under one roof. The market was shut down in the late 90’s but was then reinvented and reopened as an eating market rather than a shopping market for fresh goods. It’s common to grab a glass of beer or wine and eat your way around the market. Our guide provided us each with a glass of vermouth to try as she collected a selection of the best local bites for us to taste. 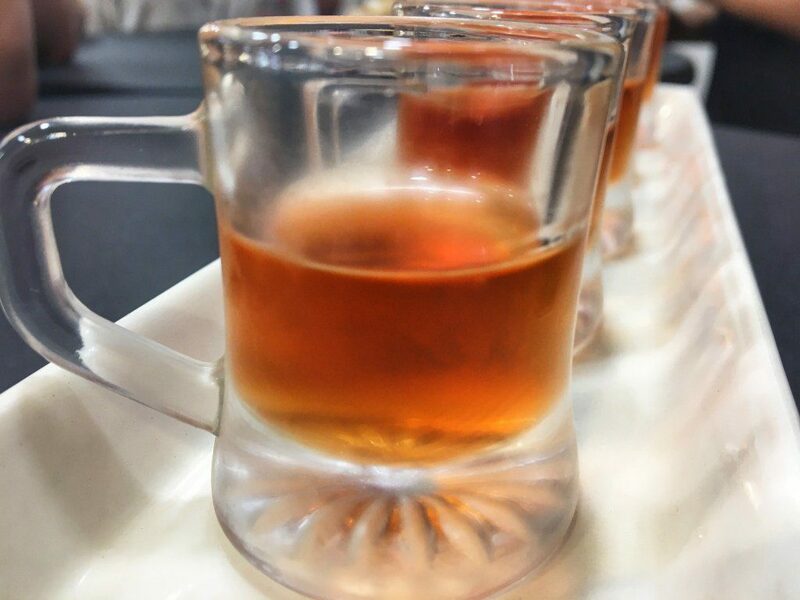 We learned that vermouth starts as a white wine that is then flavored with botanicals. Apparently, you should look for it on tap rather than in bottles. You should also pair vermouth with something salty or pickled, which is exactly what she brought back for us. 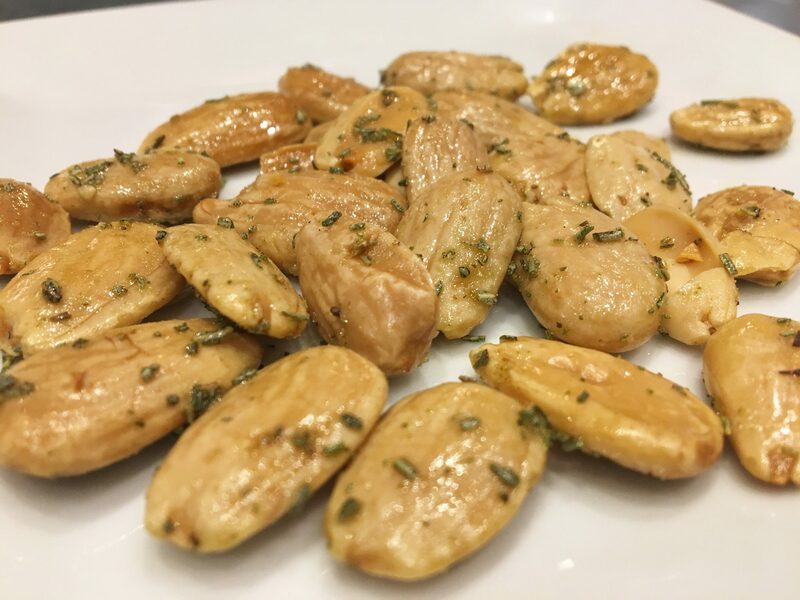 First up were spiced almonds covered in rosemary, olive oil and salt. These were so delicious and would be the perfect beer snack. The saltiness paired really well with the vermouth, just as she had promised. Next were olives. I’ve mentioned several times before that I don’t really care for olives, but I continue to try them because I once found olives I didn’t hate. 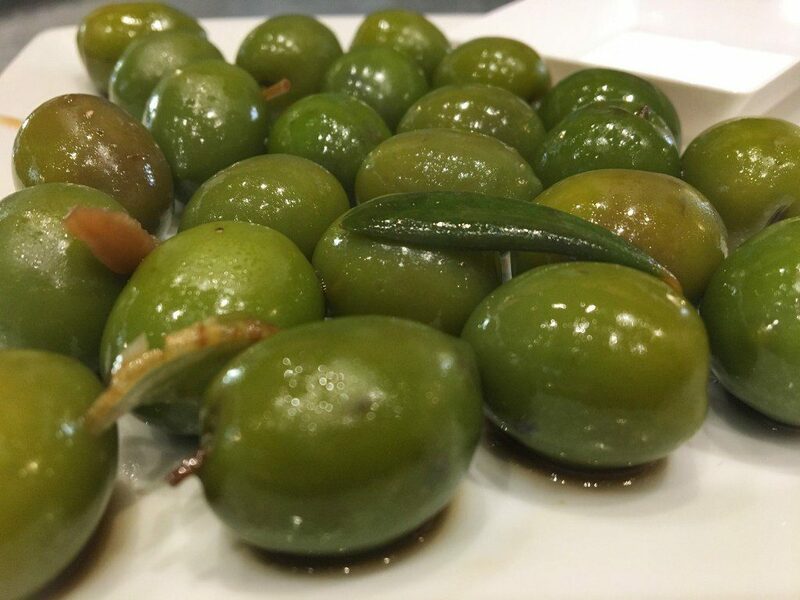 In fact, I found those olives during another walking food tour, in Istanbul, so I try to keep an open mind! I must admit, these weren’t bad either. Maybe I’m actually starting to like olives! We learned that Spain grows 262 types of olives and that this variety are flavored with fennel, garlic, oregano and thyme. I actually went back for seconds and would definitely order them again. Our third option from the market was a salty, fishy skewer to pair with the vermouth. This wasn’t my favorite, as it had the types of olives on it I didn’t like, but I loved the spicy pepper and salty fish together. If you’re an olive lover, this would have been for you. As we left the market, we were fortunate enough to make an unscheduled bonus stop at a convent for a special kind of sweet sold by cloistered nuns. If you’ve never heard of cloistered nuns, they are a very devoted type of nun that are not only never permitted to leave the walls of the church, but also cannot ever see anyone outside the church. 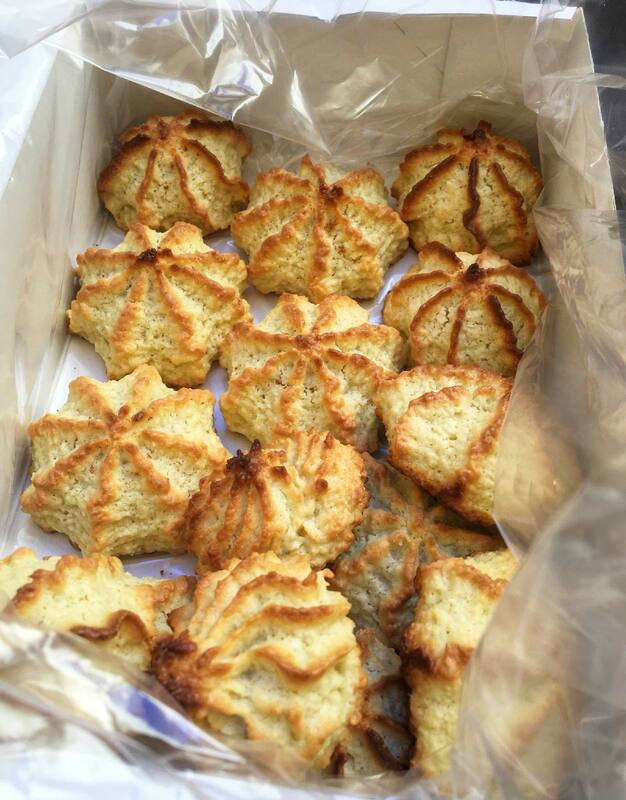 Even so, these nuns are famous for making the best cookies in town. But how could we buy cookies from nuns we aren’t even allowed to see?? They have developed a clever workaround to solve this predicament– a lazy Susan type of device. You call out your order to the nuns on the other side of the wall, send your money through, and they pass you your cookies. Even though they only had one type of cookie left for sale that day (apparently they are so famous they sell out quick), they were the guide’s favorite kind anyway. They were good- light, flaky, not too sweet. And the steady line of people leaving the convent carrying boxes attested to their popularity. Our next stop was for one of my favorite dishes of the tour- a beef tail stew served with red wine. I’ve loved several variations of beef tail stew before, so I was sure I would like this- and I was right. 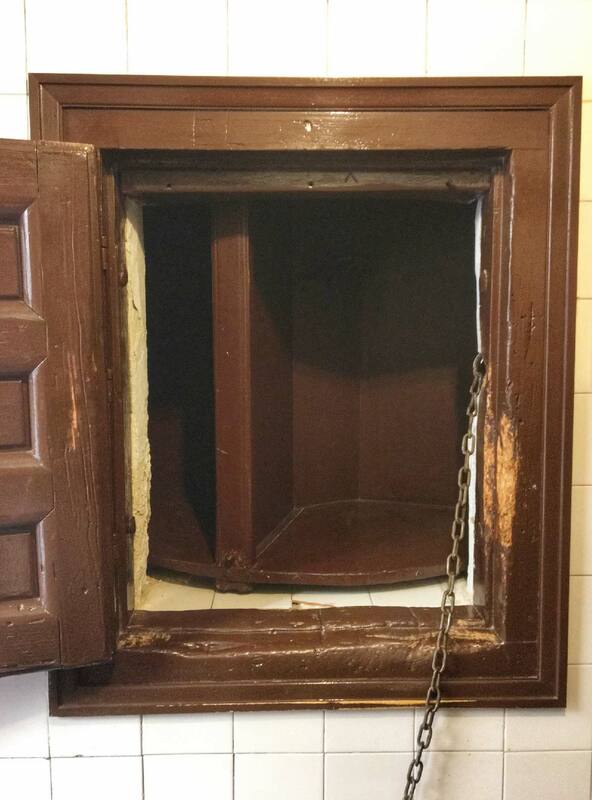 The outside of this particular tavern was painted red, and I was fascinated when I learned why- it’s a throwback to when people were illiterate. Patrons could tell from the paint job on the building that it was somewhere wine was sold. As I continued spending time in the city, I began to notice how many other places had similar paint jobs. Next we were off to try something my friends had told me about but that I had stubbornly told them was completely unnecessary- calamari sandwiches. I was happily proven wrong. The sandwiches only had three ingredients- perfectly fried calamari, fresh bread and a squeeze of lemon. That’s it- and it was perfect. They were so good that I can’t wait to have more before we leave. Our next stop on this walking food tour of Madrid led us to a restaurant that has produced the same dish in the same location for more than 100 years. The full serving is a multi course stew, but that would have been too much for our tour. Instead, we had just the first course- a flavorful broth full of angel hair noodles. This first course was so delicious that it piqued my curiosity enough to go back days later for the full experience. They were right to serve us only the first serving on this tour- it was a ton of food! 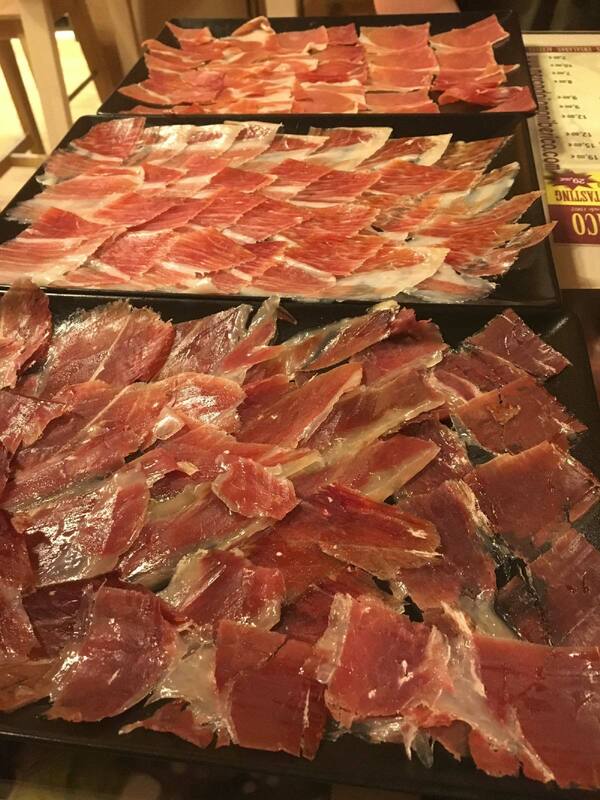 Next we made our way to a popular shop that specializes in only one thing- jamon, or Spanish ham. Here we tried several different types of ham- even one that cost nearly 200 euro a kilo! We learned all about the ham making process- the salt curing removes all the moisture and allows the pork legs to be hung to dry for up to five years. We also learned how jamon is always the same type of meat- the back leg of the pig, cured in salt and then air-dried. The difference in quality (and price) is determined by the type of pig, what it was fed, and how long it has been cured. Serrano ham, one of the most typical varieties, is on the lower end and aged between 12-24 months. For Iberico ham, pigs are fed a typical diet and aged for 18-24 months. Iberico de Bellota is made from black-hooved acorn fed pigs. The pigs must go through a certification process ensuring they each have a certain amount of land to roam, as they can eat up to eight kilos of acorns per day. They must also age for a minimum of three years, although the samples we tried that day were aged for 5 years. 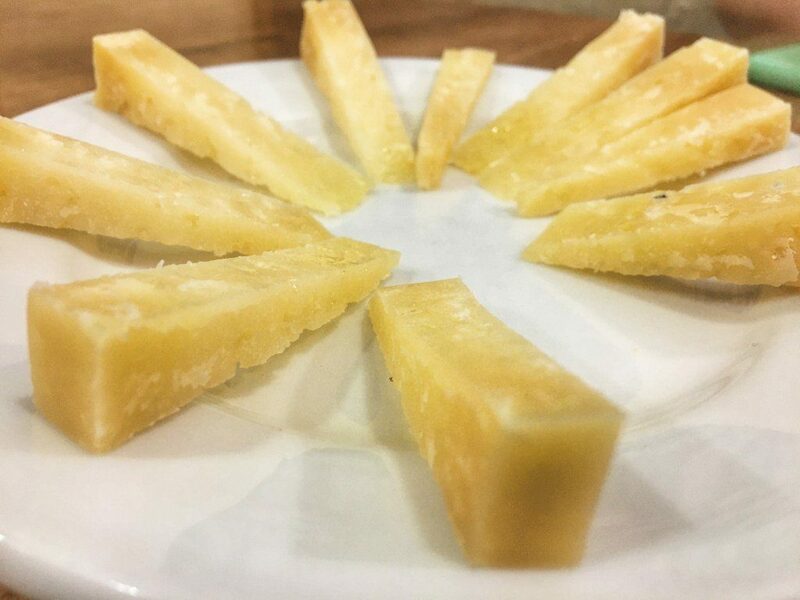 The Iberico de Bellota samples melted as soon as they hit our tongues, and you could definitely taste the nuttiness. I can see why it costs so much– it’s a true delicacy! 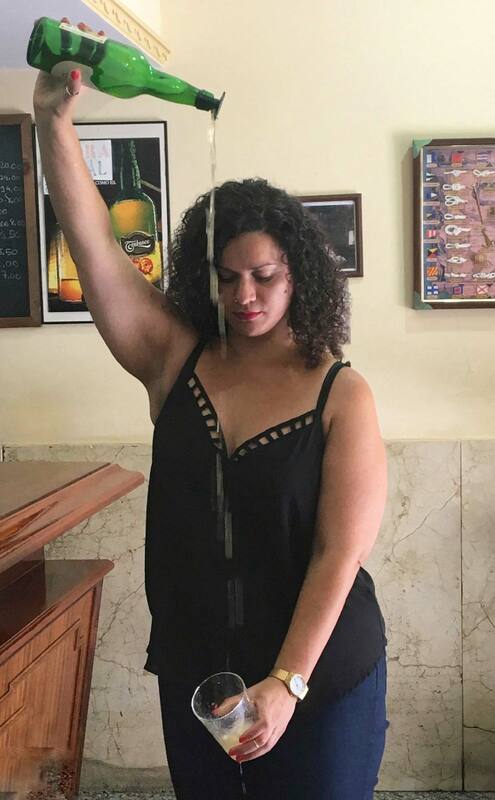 Our next stop was for what Joy promised us was the best tortilla patata, or Spanish omelet, in town- a tall claim in Madrid, a town famous for their tortilla patata. 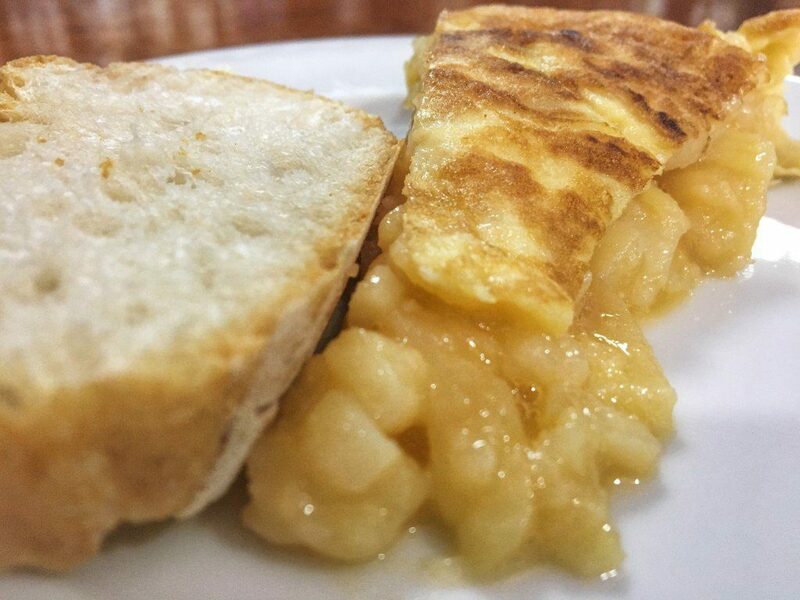 If you’re not familiar with tortilla patata, it’s a simple dish but very popular and really delicious. 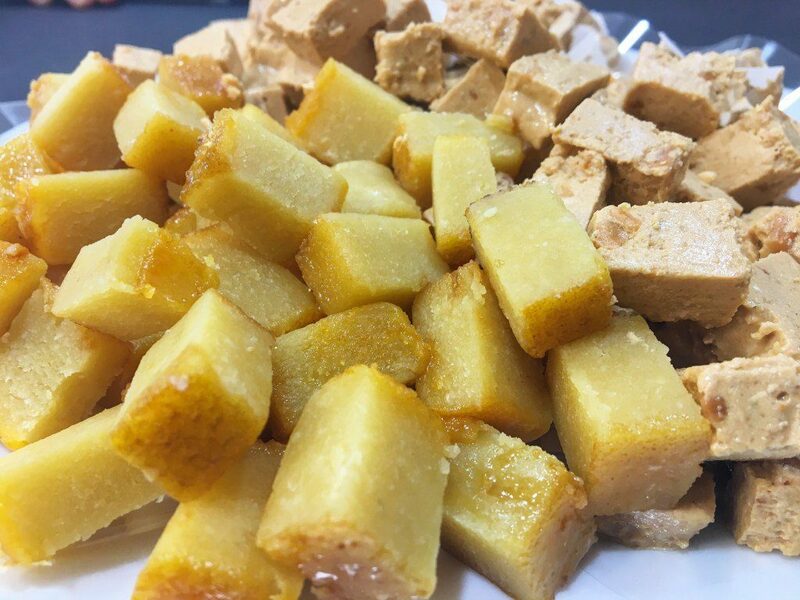 The dish is made primarily of potatoes and eggs, and we learned that what makes this one so delicious is the technique, not any special ingredients. I have to agree this was one of the best I’ve ever had- both creamy and crusty. I loved that we were given fresh bread to scrape it up with. On the same stop we also sampled a famous local cheese, Manchego, and Spanish cider. The cider went perfectly with the super salty cheese. We also learned how to properly pour cider. You’re never supposed to pour cider for yourself- always for others. We each took a turn pouring, and the gracious owners of the hotel were kind enough to pretend not to notice the mess we left all over their floor. We ended our tour on a sweet note, at a shop that has been in operation since 1775 serving gourmet Spanish candy bars. What made this shop interesting is how they’re modernizing. Typically, these were a dessert that would only be served during the holidays. But the shop is teaming up with local chefs to create new twists on the classic dessert to make it a year round offering. They were super sweet, and everyone with a sweet tooth loved. Several people even bought boxes to take home. Like most digestives, it was a bit strong, but the cranberry flavor was nice. I would definitely have this one again! Practical Information: To book this tour for yourself, click here. I suggest booking well in advance, as Devour is one of the most popular tour companies in town. Disclaimer: I would like to thank Devour for having me as a guest on their tour. All opinions remain my own, as always. 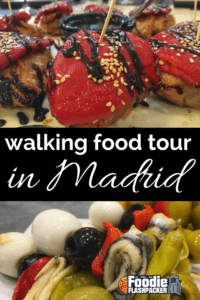 What part of the walking food tour of Madrid looked best to you? Is there anything you’d love to try or something you would never try? Let me know in the comments section below! Food tours are always a lot of fun but in Madrid? How could I miss this? Spanish food is delicious and your photos made me hungry so I’ve already noted it down for our next trip over there, thank you!!! 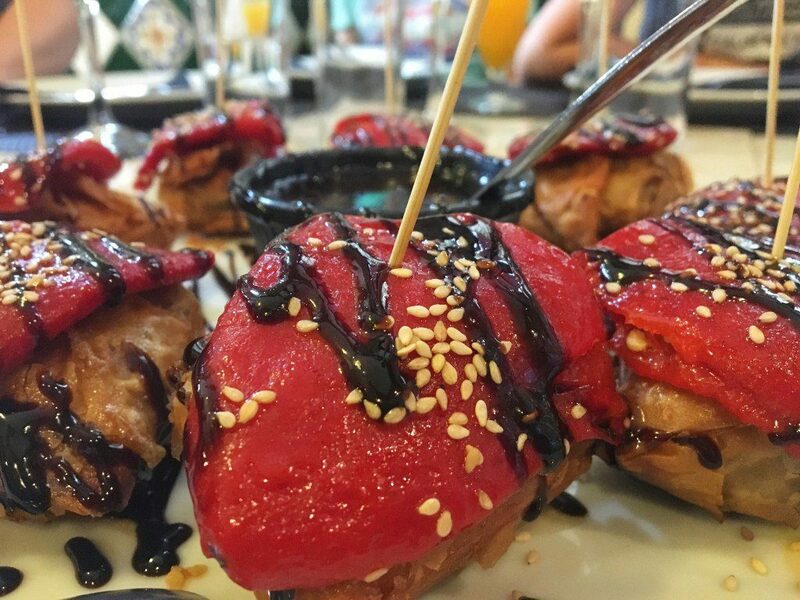 What I like about food tours in Spain is the atmosphere of the tapas bars and restaurants. There are so many of them serving up such delicious food in vibrant surroundings. I miss the cheeses. Now this is my kind of tour, I do love a good foodie tour!. But I do love the way the Spanish schedule their meals. Large lunch and then that late night dinner which isn’t as big, totally would suit me. You really did get to try and see some amazing food, sort of jealous! We’ve never done a food tour but I may have to do one in Spain, especially since we love food so much. The food in your pictures also looks so tasty! What a fab looking food tour. I, like a few others, have yet to do a food tour. But this post has certainly piqued my interest in trying one. I love food walking tours. They are such great value and you learn so much. This tour looks amazing! Thanks for a great post. I will bookmark it for future reference. Those olives look amazing! I did a good tour in Toronto and it was amazing! I would love to do another one abroad. It looks like they offer a good mix of vegetarian options that I could snack on too. 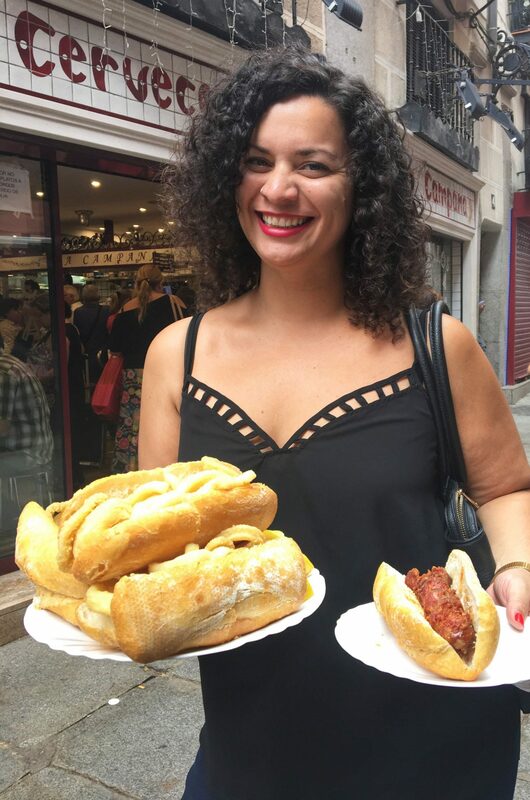 The Madrid food tour was one of my favorites! They were really great and it was a good start to our trip. Plus, spanish food is sooooo goood. I super loved this a lot. The olives look amazing! Love the look of the anchovy skewers too. Will be pinning this for reference on our next trip to Madrid! Thanks! We just got back from a 90 day trip through Spain and Portugal. We spent a week in Madrid, I wish I would have known about this tour. Looks and sounds like a perfect way to get acquainted with the food there! Looks awesome Nathan. I would absolutely love this tour. I’ve never heard about the cider pouring before so that was a new thing to learn. Spanish jamon, especially iberico is soooo expensive, isn’t it? This all looked totally amazing. Lucky you. Hi Nathan! Spanish people seem to have very special food schedule. I like the second breakfast at 11 am that you mentioned. Although the dinner is so much later than I am used to – I always have fear of getting fat when eating late, but the Spanish people seem to have good health and figure overall. 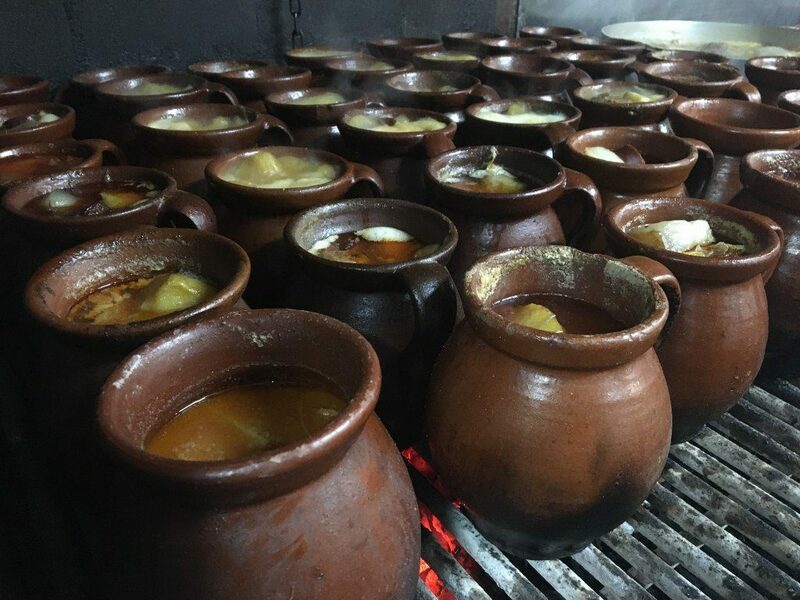 No idea how they do it – when I am in Madrid, I will join Devour Tours as well to find out more. 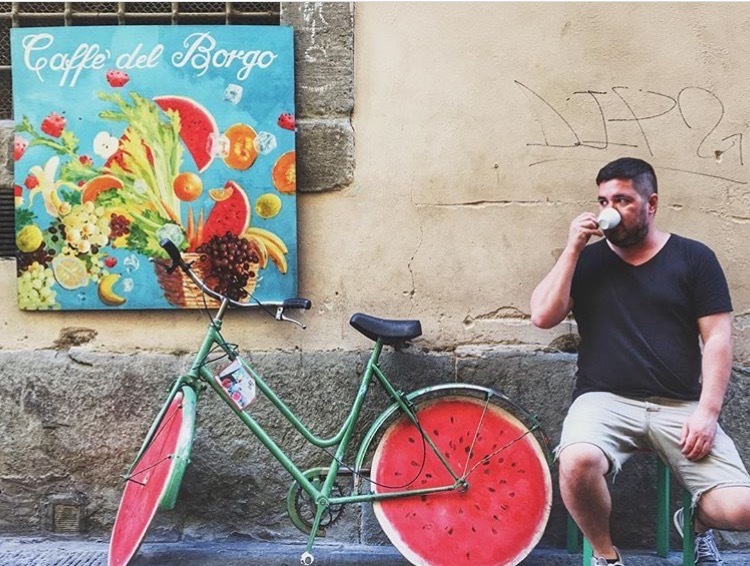 We’ve recently done some walking food tours, they are an incredible way to explore and dine! I love the Spanish philosophy on a coffee and sweet followed by a second breakfast, I could handle that! The one that gets me in Europe is how late they eat at night! The gourmet candy bars look divine! 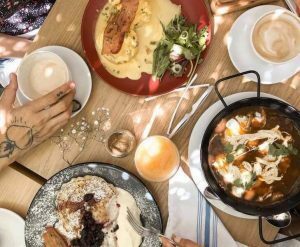 Everything looks really good to me and so with their breakfast since I have a sweet tooth. But what got me is how amazing the owner to pass to their employee. Food looks so tasty as well. And oh.. the dinner with tapas sounds different to me as tapas is for breakfast to us. This really seems like a tour I’d love to try! It seems like you had a fabulous time. And how do you properly pour cider? Eating in Spain is one of my absolute favorite things on Earth. This tour looks like a lot of fun. Great info! I would definitely do the same thing whenever I’ll visit Spain! Awesome list of foods you made me hungry. And yes Calamari doesn’t need bread to be awesome! Wow, those olives look amazing. I didn’t realize that there are so many different types of ways you can eat olives. I guess going on food tours can help you see different ways you can use an ingredient. Thanks for sharing this wonderful post with us. I really liked your post and will definitely share it with my friends. Hope to see more stuff from your side.